Separate eggs from yolk. In a bowl, combine WHOLE MILK Ricotta, egg yolks, milk, vanilla, powdered sugar, baking powder and salt. Gradually add flour while blending. Whip egg whites to a peak and gently fold into egg mixture. (This is a real key to the success of the pancakes. You want the batter to be light and airy.) Use batter immediately. On griddle or skillet ,(butter the griddle then wipe off with paper towel) pour enough mixture to make about a 4 inch in diameter pancake. When bubbles form, flip pancake. Cook until light golden brown. 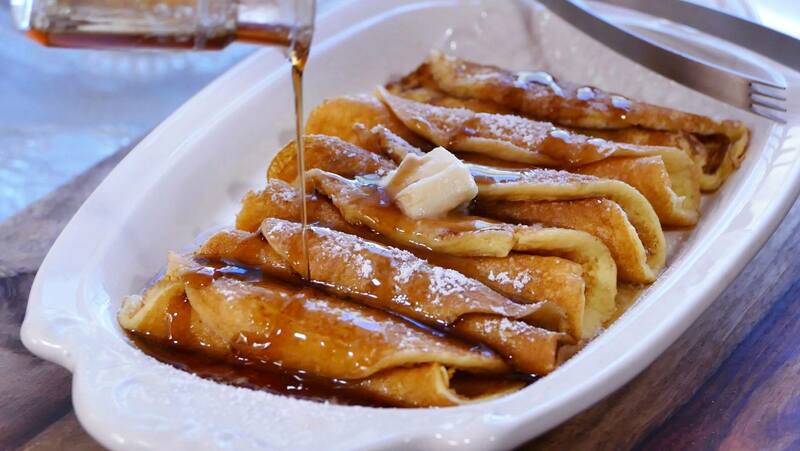 Roll up like crepes and serve with hot maple syrup and butter. Sprinkle lightly with powdered sugar. Makes about 12 pancakes. Serve 3 crepes per serving. It’s best to serve the Ricotta Pancakes as they come off the griddle. Trust me, you won’t have a problem finding takers! Please let me know if this becomes one of your favorites, too!